I had an existential feast this weekend, seeing "Thom Pain, Based on Nothing," at DR2 Theater on 15th St. on Saturday night, and then, on Sunday afternoon, "Jarhead." Neither was perfect, but both were thoughtful and provocative. Thom Pain has been extended several times, and now T. Ryder Smith has replaced James Urbaniak as the show's sole performer. He's an engaging presence as he tells the discursive story of a boy, his dog, the dog's electrocution, bee stings and a failed relationship. The script, by Will Eno requires him to trip back and forth between the narrative and discursions and asides. He doesn't know if he's good enough. For life, for this show, for love. Life is pain for Mr. Thom. It's a smart-alecky, knowing treatise, shot through with real feeling, and Smith is generally up to the challenge. He fills the earlier moments of passion with genuine feeling, and several moments achieve the sublime. But, toward the end, as tears and sobbing are required of him, he doesn't seem to quite have it in him, and is forced to go through the forms of feeling, ending the evening flatly. My heart goes out to Smith. The show is performed two times a night, at six and nine, in order to maximize sales from the small DR2 theater, I presume. And the performance I witnessed was peopled largely by TKTS (a discount ticket booth) who were probable expecting a play of some sort, or at least some kind of attempt at spectacle. Not the best audience for a performer to have to bare himself before. I, myself, had brought four people along: my aunt, her wife, and two friends of theirs. I was accutely aware once the show started that it was a poor choice for tourists. Smith must have been aware of this, too as he fought his way to the end. 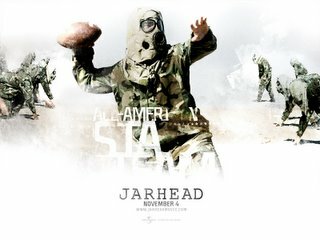 As for Jarhead, there is no shortage of writing on this Hollywood offering, so I'll keep it short. It is not nearly so hollow as many reviewers would have you believe. And it is well worth seeing for an askew view of the Marines, as well as some incredibly haunting visuals. It also happens to be funny and interesting the whole way through without ever dragging. It even manages a few moments of genuine pathos. Peter Sarsgaard and Jake "Beefcake" Gyllenhaal are great, and Foxx does his job competently. Both works ask not just "Why? ", but "Why bother? ", and because the question is more important than the answer, do not, cannot answer the question more fully than with a "Because." True to life, but "Because" does not make for a dramatic ending. Reality doesn't follow a conventional story arc, and neither do "Thom Pain" and "Jarhead." Which is fine, but as audience members we've been trained to expect catharsis, and I was disappointed at the fizzles that capped each show, even as I left the theater deep in thought. Sure, it's smart, it's honest, but how bout a just one big old bang? Please? No? Okay. Stinking art. Hey beckett, you have a pretty good blog here! I'm definitely going to bookmark you! Come and check out Frank Centofante if you get time, Nice going ! Why do all spammers use the same "nice blog" ruse? Perhaps they should spend more time on their pitches. Instead they smack you with absurdities like "I have a Frank Centofante Fantasy Knives". Who is this Mr. Centofante? The writer? But I thought the writer was Fantasy Knives. Come and check out custom knife if you get time, Nice going ! Wow, Darrell and Frank had almost exactly the same reaction to your blog! Is that weird or what? Hm, why would a post speculating about the unresolved, questioning nature of two somewhat unconventional artworks attract two spams about fantasy knives? A mystery only a marketer can solve. I don't think "marketers" are responsible for the spam. More like some dude with a lot of knives to sell. I have a fantasy about a knife. In it, I throw a knife all the way around the world. On its journey it chops off the fingers of all the pathetic knife merchants who think they can attract more business by spamming me, of all people. Plus, it frightens Beckett's enemies into submission. Also, the knife confers super powers.